Chien-Chi Chang, The Chain 1993-1999. Installation Adam Art Gallery 2005. Still Present: Exploring Psychiatric Institutions in Photography explored the corporeal and subliminal nature of psychiatric institutions, with a focus on the spaces and those who occupy them. Curated by Sophie McIntyre, the photographs in Still Present investigated aspects of the ‘in between’, exploring the interplay between the real and the illusory, public and private, and fact and fiction. Over the centuries, mental illness has been the focus of considerable human interest, attracting extensive scientific and scholarly analysis as well as media attention. Prior to the nineteenth century, mental illness was associated with the sacred, a signifier of ‘mysterious and metaphysical’ forces at play. With the advent of modern sciences, the dialectic between reason and insanity emerged and a new space of exclusion was established. As a shift towards moral reform in the nineteenth century, the ‘asylum era’, as it became known, advocated for the institutionalisation and segregation of the mentally ill. French philosopher and theoretician, Michel Foucault, famously described these mental institutions as a Panopticon – a system of surveillance and control. More recently, with the de-institutionalisation of mental health, many of these psychiatric hospitals have been closed down. In this exhibition, the conjunction between ‘institutional’ and ‘domestic’/ ‘social’ space co-existing in the confines of a psychiatric hospital, is one of the key themes explored. The ‘site’, as a physical space, is not the central focus of attention for these artists. Rather it is the way in which the site becomes a receptacle for the expression of human existence. A glance, a gesture, a graffiti-inscribed door are all signifiers of human interaction or intervention. Anne Ferran and Chien-Chi Chang’s photographic portraits explored the construction of social/power relations within the institution, whereas Jono Rotman focused on the architectural construction of abandoned and unpeopled institutions, examining the traces of human life that remain within them. Their works transcend the boundaries of documentary photography, re-photographing and re-presenting their subjects as they record and reveal with acute detail and profound insight the daily lives of individuals who occupy these heterotopic spaces, which typically remain unseen or unnoticed. Each of these artists’ series developed over a prolonged period of engagement, often over several years, with their subjects. As such, they are seen as personal observations of the human condition. 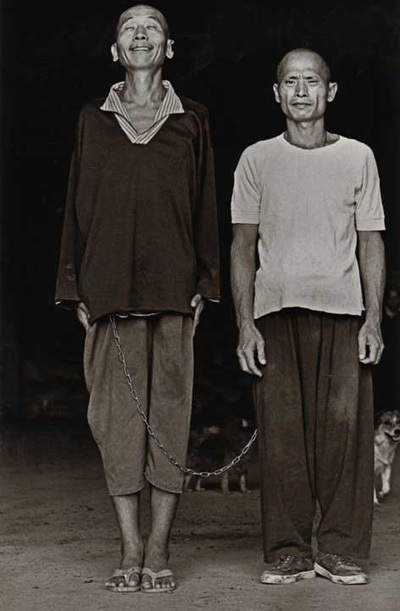 Internationally acclaimed Magnum photographer Chien-Chi Chang’s work included in Still Present was a series entitled The Chain. This work comprises a visually striking series of portraits of patients at Lung Fa Tang (Lung Fa Temple) in Kaohsiung, southern Taiwan. During 1993-1999, Chang visited this temple, which operates as a psychiatric institution, housing 700 patients. Many of these patients have been diagnosed as mentally ill, while others have suffered from drug abuse. In a country that is generally reliant on the ‘family unit’ to provide social welfare support, Lung Fa Tang provides a sanctuary for the mentally ill whose families are either unable or unwilling to offer assistance. In these images, the patients are shown bound together in steel chains. This is part of a treatment programme in which a more ‘stable’ patient is chained together to assist the ‘less stable’. Naturally, the practice raises some serious ethical issues. When contemplating these images, however, the empathy and tenderness revealed in the patients’ facial expressions and gestures towards the other, makes one wonder if perhaps we are all bound, metaphorically, be it in love, desire or death, by the Chain of Compassion. According to Buddhist belief, the chain is symbolic of worldly desire that is integral to karma. 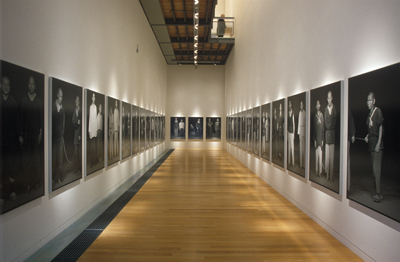 The Chain is a major body of work that has featured at the Venice Biennale (2001), the Sao Paulo Biennale (2002) and at the International Center of Photography in New York (2003). Chang’s work has also featured in exhibitions at MOMA Contemporary Inc, (Fukuoka, Japan), Taipei Fine Arts Museum, (Taipei, Taiwan), Queens Museums of Art, (New York), Bibliotheque Nationale de France, (Paris), and the Metropolitan Museum of Photography, (Tokyo). As a photographer and installation artist, Anne Ferran has been exploring the confluence between history and photography, memory and identity. The artist focuses her attention on marginal spaces, and those who may have been excluded or overlooked in the ‘grand narratives’ of history. Her projects have involved visually excavating the sites and material belongings that women and children once occupied or possessed. The works in Still Present reflected Ferran’s ongoing interest in these histories and in the stories embedded in museum objects and archives. These images are drawn from photographs of female patients taken in 1948, at Gladesville Hospital that was once a psychiatric institution in Sydney. Ferran discovered these images in a library’s archive, and apart from these extant photographic records, the patients’ names, and their admission and exit dates (if they did in fact leave), there was no further information made available to the artist about these women. Through the processes of photographic reproduction, the artist has given these anonymous individuals a presence. In 1-38, Ferran re-photographs and crops these images of female patients, drawing attention to their gestures and clothing. In Book 1: 1-38 and Book 2: 1-38, Ferran creates composite images of the women’s faces so that their expressions become barely discernable to the viewer. These images, along with Any Body, reveal and commemorate the lives of these women. Anne Ferran’s work has been exhibited in major exhibitions and galleries internationally including at the National Museum of Australia (Canberra), Dunedin Public Art Gallery (Dunedin), Australian Centre for Photography (Sydney), Cité Internationale des Arts (Paris), The Ian Potter Centre: NGV Australia (Melbourne), Art Gallery of New South Wales (Sydney) and at the Serpentine Gallery (London). 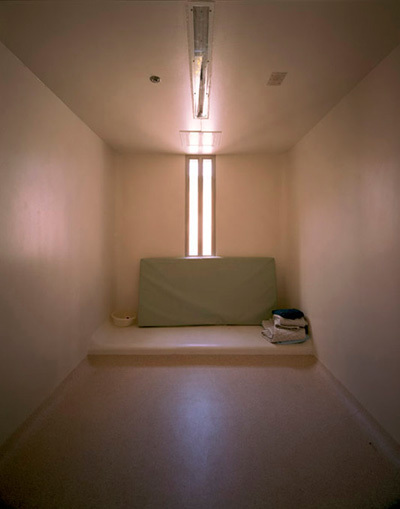 Jono Rotman’s series entitled Chambers is the culmination of a three-year investigation into the unoccupied spaces of psychiatric hospitals and prisons in New Zealand. 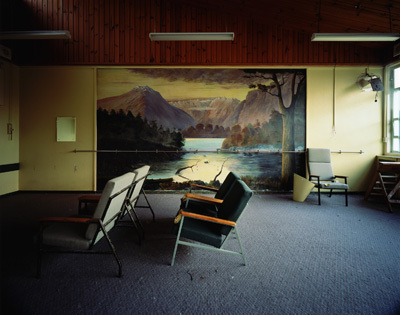 Chambers was created during 2000 – 2004, when Rotman travelled throughout New Zealand photographing psychiatric institutions and prisons that had been abandoned following the de-institutionalisation of mental health care in New Zealand. In this series, Rotman focused his lens on traces of human presence in these otherwise vacant, alien and clinical spaces. The photographs reveal stark, utilitarian interiors where signs of human life and domesticity are captured in graffiti scratches and personal detritus. These images highlight the mundane and highly regulated lives of those who inhabit these personalised, visceral spaces, in which spatial hierarchies and sanitised uniformity compete with the need for human expression. Rotman has exhibited his photographic work in New Zealand and Australia and has also practiced as a commercial photographer over the past decade. During this time he has been awarded some of the most prestigious prizes in the industry, including the Epson Advertising Photographer of the Year (2002) and the Axis Advertising Awards Supreme Award (2002).